502. An “epicyclic train.” Any train of gearing the axes of the wheels of which revolve around a common center is properly known by this name. The wheel at one end of such a train, if not those at both ends, is always concentric with the revolving frame. C is the frame or train-bearing arm. 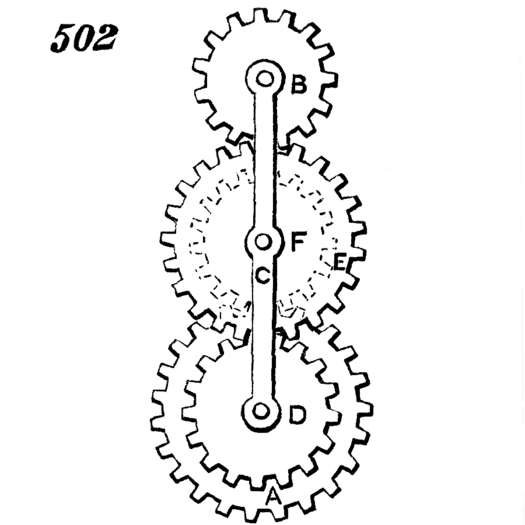 The center wheel, A, concentric with this frame, gears with a pinion, F, to the same axle with which is secured a wheel, E, that gears with a wheel, B. If the first wheel, A, be fixed and a motion be given to the frame, C, the train will revolve around the fixed wheel and the relative motion of the frame to the fixed wheel will communicate through the train a rotary motion to B on its axis. Or the first wheel as well as the frame may be made to revolve with different velocities, with the same result except as to the velocity of rotation of B upon its axis. In the epicyclic train as thus described only the wheel at one extremity is concentric with the revolving frame; but if the wheel, E, instead of gearing with B, be made to gear with the wheel, D, which like the wheel, A, is concentric with the frame, we have an epicyclic train of which the wheels at both extremities are concentric with the frame. In this train we may either communicate the driving motion to the arm and one extreme wheel, in order to produce an aggregate rotation of the other extreme wheel, or motion may be given to the two extreme wheels, A and D, of the train, and the aggregate motion will thus be communicated to the arm.